Spend the day exploring the capital of Imperial Russia, St. Petersburg. Enjoy a commentated panoramic tour of the city with photo stops. Drive across the Neva River to Vasilievsky Island, which is flanked by two rostral columns, admiring the early-18th-century Peter and Paul’s Fortress. 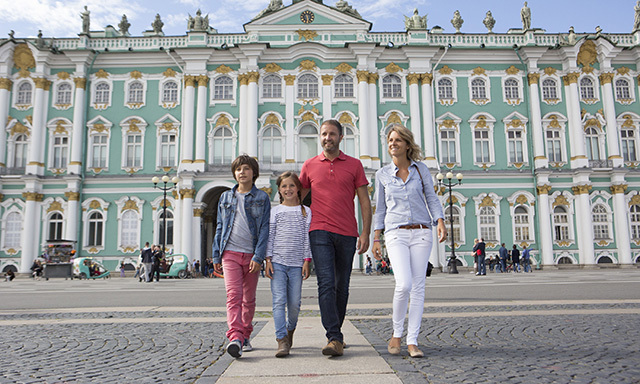 Then make your way to the iconic Hermitage, founded by Catherine the Great. The museum, part of the opulent Winter Palace, houses 3 million-plus items, including the world’s largest collection of paintings. Spend a couple of hours marveling at grand palace throne rooms, reception halls and masterworks by giants of art history, including Leonardo da Vinci, Rafael, Rembrandt and many more. Also visit St. Isaac’s Cathedral, gazing at the magnificent dome decorated with 200 pounds of gold. Plus stop to photograph the Church of Resurrection on the Spilled Blood, a spectacular multicolored, onion-domed church. Your tour also includes a delicious sit-down lunch, time for souvenir shopping and a drive down Nevsky Prospect, Russia’s Champs Elysees. • Panoramic tour: Photo stops include St. Isaac’s Cathedral, a spectacular onion-domed church, Nevsky Prospect and much more. • Delicious lunch: Savor a sit-down meal at a typical restaurant. • Free time: Enjoy about half an hour on your own to shop for gifts, souvenirs and other treasures in one of the recommended souvenir shops. • The Hermitage: Explore this famous museum housing 3 million-plus items, including the world’s largest collection of paintings. • The order of the sights visited may change without notice. The Hermitage Museum may change exhibits or close some of its halls without prior notice. • Guests must be able to walk approximately two miles over even surfaces, with more than 200 steps. Many steps inside the Hermitage Museum may be challenging for the guests with walking difficulties. • St. Isaac's Cathedral has been recently equipped with the lift. • A few benches are available in the Hermitage and some chairs available in souvenir stores. • Guests may wait or stay on the coach during any portions of the tour. • Coach can accommodate up to two collapsible wheelchairs. • There are four steps to enter/exit the coach. • Drivers or guides cannot assist guest entering/exiting the transportation. Large bags, umbrellas and heavy jackets must be checked before entering the Hermitage. • In addition to English, this tour is offered in French, German, Italian, Portuguese, Russian, Swedish, Norwegian, Danish and Spanish. • A minimum of 20 guests are needed for the tour to run in a different language.